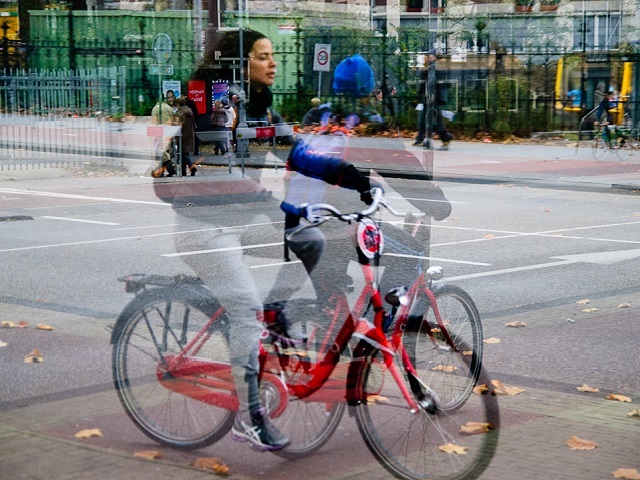 Changing urban mobility trends among younger generations in the developed world broadly reflect a growing preference for biking, walking, public transport, and shared mobility services over car ownership. Photo by Kartik Anand. This is the second post of the “Sustainable Urban Transport On The Move” blog series, exclusive to TheCityFix. The late Dr. Lee Schipper, an internationally renowned researcher on the linkages between transport and climate change who co-founded EMBARQ in 2002, initiated a growing body of research that indicates an intriguing phenomenon – a recent stabilization, and in some cases a decline, of car use in the developed world. The stabilization of car use in cities is the main driver of this trend. In many developing countries, rapid urbanization and economic growth are currently contributing to increased motorized travel in cities. It’s uncertain if cities in the developing world will follow the same pattern of motorization trends experienced in the developed world. An examination of changing urban transport behavior among younger generations in the developed world reveals a significant opportunity for policymakers in the developing world to leapfrog towards a more sustainable urban transport future. 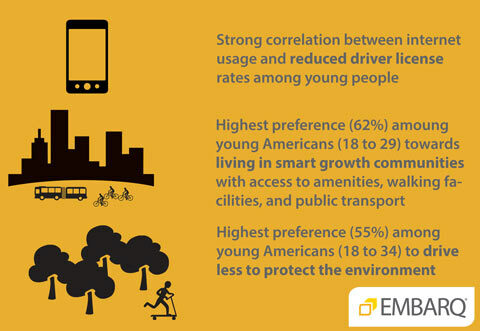 Several studies point to changing trends in urban transport consumption among younger generations in the developed world. Broadly, these trends reflect a shift in preferences from car ownership towards walking, biking, public transport, and shared mobility services. Household travel survey data from the United States for 2001 to 2009 indicates that the average annual vehicle miles traveled by people aged 16 to 34 has decreased more drastically than in any other age group, from 10,300 to 7,900 miles – a drop of 23%. Further, data shows a decline in driving among young people who were employed and financially stable, indicating that lifestyle changes other than the global economic recession contributed to the decline. In Europe, car sales have been declining for many years, and one of the key reasons is changing preferences of younger generations. In a comprehensive study of changes in the age composition of drivers in 15 countries, findings revealed that driving license rates among the younger generations declined significantly between the 1980s and late 2000s in the U.S., U.K., Canada, Germany, Japan, and Sweden. Accompanying declining driving trends is a shift towards more walking, biking, and public transport trips. In the U.S., young people aged 16 to 34 made 16% more walking trips and 24% more bicycle trips in 2009 compared to 2001. Public transit usage by this group saw a 40% jump in the same period. Additionally, young people from affluent families, with incomes of over $70,000 per year, doubled their public transit usage and biking trips. Comparatively, a recent European study found that public transport usage has increased among young adults aged 20 to 29 in France, Germany, the U.K., and Norway over the last few decades. It also found that the decrease in car travel by young adults was accompanied by a corresponding increase in the use of alternative modes in Germany and the U.K. Younger generations are also more likely to embrace the sharing economy compared to other age groups, due to their preference for “access over ownership” of resources. In a 2011 survey by Zipcar conducted in the U.S., people between the ages of 18 to 34 indicated the highest preference, 70%, for using alternate modes of transportation to the individually owned car, including public transport, car sharing, and carpooling. In Europe, many German car manufacturers are turning their attention to carsharing in the hopes of reviving revenue, particularly by focusing on young German customers. So why are young people driving less and showing a greater preference for walking, biking, public transport, and shared mobility services? The answer might be tied to their location preferences, use of technology, and health and environmental awareness, as shown in this graphic supported by evidence from Sivak and Schoettle, Belden, Russonello & Stewart LLC, and Zipcar. The use of technology, and environmental and health awareness are factors driving the changing trends in urban transport among younger generations. Graphic by EMBARQ. These key factors driving changing urban transport consumption patterns among younger generations in developed countries are driven more by fundamental shifts in lifestyle and preferences than short-term impacts like economic cycles and fuel prices. Given the major impact the travel choices of younger people can have on aggregate levels of motorization, it’s possible that motorization in developed economies may have already peaked – a ground breaking finding marking a fundamental change in the urban transport landscape of developed countries. Could this shift also be coming to the developing world? This possibility underscores the need to implement policies, programs, and investments in developing countries that promote sustainable transport and urban development without catering to traditional patterns of car-centric growth.